Ga, Atlanta. 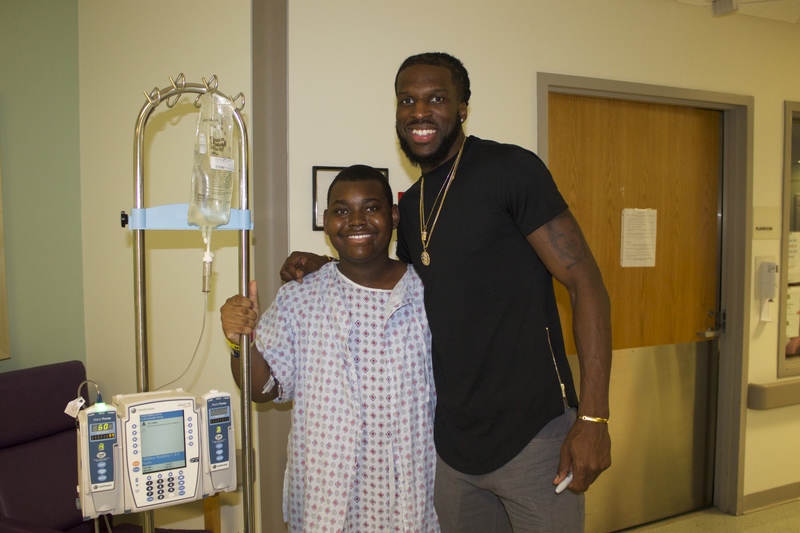 21 April 2015 – Yesterday, DeMarre Carroll, Atlanta Hawks small forward and founder of Carroll Family Foundation, arrived at the Children’s at Egleston pediatric hospital to surprise the young transplant patients with a visit on behalf of his foundation. As DeMarre entered the Carlos & Marguerite Mason Transplant Center, the staff and patients were smiling ear to ear with excitement, eager to talk sports, health and much more with the Atlanta star. DeMarre and CFF staff went room to room to talk to, encourage, take pictures and sign for the children who are battling with liver, kidney, heart and lung diseases. As an advocate and survivor of liver disease, DeMarre founded the Carroll Family Foundation which focuses on raising awareness and funding towards pediatric liver disease and disorder. One of CFF‘s initiatives is to partner with CHOA (Children’s Healthcare of Atlanta) and their Carlos & Marguerite Mason Transplant Center to donate funding towards their research, development, treatment and transplants. “As someone who deals and lives with liver disease daily, I know how important it is for these kids to be encouraged that they can still sustain a long and healthy life, like me. Here at CFF ‘we believe’ in you and your future, and will continue to do what it takes to gain support nationwide to bring awareness to liver disease and disorder,” DeMarre Carroll states. CFF’s lives by the motto – ‘We Believe’; informing our youth that we, CFF, believe in your future to live a fulfilling, sustainable life with Liver Disease or disorder. CFF wants everyone to feel confident that we are here to help, constantly sending the message to let survivors and fighters know that you are not alone in this journey. CFF’s family support services will focus on providing meet up groups, social gatherings and more. CFF will ensure that Pediatric Liver Disease and disorders are recognized, acknowledged, prevented and treated by providing educational and developmental resources, and family support services to those affected.